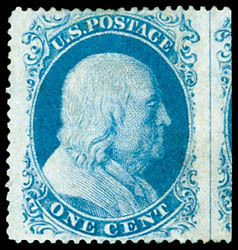 1857, 1¢ blue, type II, position 80L12, straddle-pane single showing guideline and significant portion of adjacent stamp at right, full o.g., wide margins and exceptional centering with perfs clear of design, bold color, Extremely Fine; with 2013 P.S.E. Graded certificate (XF 90). A CHOICE MINT POSITION SINGLE OF THE 1857 1¢ TYPE II FROM THE SCARCE PLATE 12. 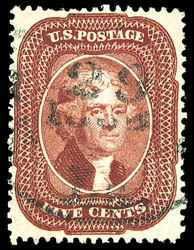 1857, 3¢ rose, type I, o.g., never hinged, a remarkable single with full margins at top and sides, strong bold color, Very Fine and choice; with 1986 P.F. certificate for block. Scott No. 25 $2,500 for hinged. AN EXTREMELY RARE NEVER HINGED EXAMPLE OF THE 1857 3¢ ROSE TYPE I ISSUE IN EXCEPTIONAL CONDITION. 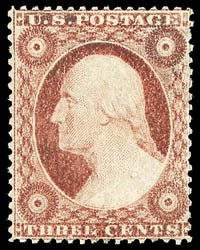 During the transition to perforating stamp, various 3¢ plates from the imperforate issue where used in early 1857, producing the perforated type I & II issues (Scott 25 & 25A) while new plates where being created to accommodate for the new perforations which where ready later that year. 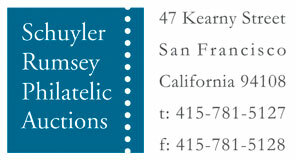 The imperforate plates never provided spacing for the perforations, so examples having margins on three sides is rare. With the fact that this issue had a very short production span, it is remarkable that any n.h. examples bearing three margins exist at all. We known of only two examples that bear these qualities, which both come from the same multiple. 1857, 3¢ rose, type I, dry print variety, o.g., lightly hinged twice, rich bright color, fresh and attractively centered, Very Fine; with 2014 P.F. certificate. A CHOICE AND VERY SCARCE MINT EXAMPLE OF THE 1857 3¢ ROSE TYPE I. 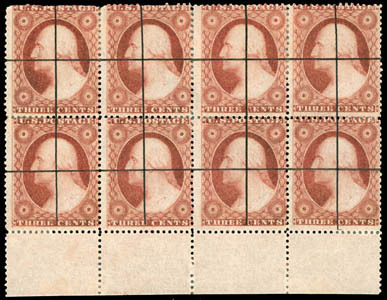 1857, 3¢ dull red, type III, bottom margin block of 8, full o.g., some hinged reinforcements, strong bold color, some short perfs from separation at top left, F.-V.F. and rare. Scott No. 26 Estimate $1,500 - 2,000. 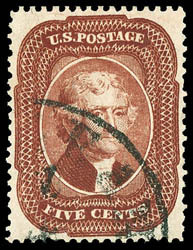 AN EXTREMELY RARE MULTIPLE OF THE 1857 3¢ TYPE III ISSUE BEARING RULED LINE PRESENTATION MARKINGS. These presentation of control lines have thought to be for presentation specimens or samples. Most of these are single stamps with very few multiples known. 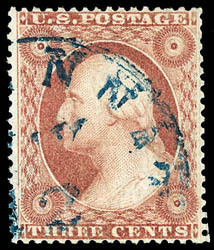 1857, 3¢ dull red, type III, double transfer and line through "Postage" and "Three Cents", position 87R15, also showing doubling of all four rosette centers, complementary blue town cancel, choice centering amid wide margins with perfs not impinging on the design, strong bright color, Extremely Fine; with 2013 P.F. certificate. Scott No. 26 var. $2,500. A WONDERFUL EXAMPLE OF THIS RARE AND DRAMATIC DOUBLE TRANSFER VARIETY - CONSIDERED TO THE THE FINEST KNOWN. 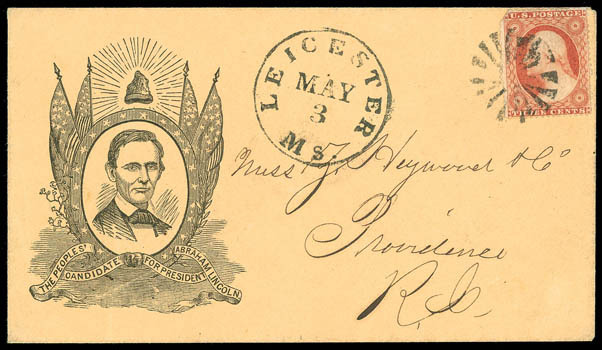 1857, 3¢ dull red, type III, corner clipped, tied by fancy circle of wedges cancel on buff Beardless Lincoln Campaign cover (Milgram AL-66) with "The Peoples' Candidate for President, Abraham Lincoln" slogan to Providence R.I., matching sharp "Leicester Ms. May 3" cds, Very Fine and attractive. Scott No. 26 Estimate $500 - 750. 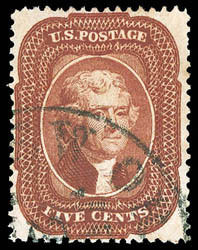 1857, 5¢ red brown, type I, town cancel, exceptional centering amid nicely balanced margins, rich deep fiery color, Extremely Fine and choice; with 2015 P.S.E., 2002 (for a 28A) and 2007 P.F. certificates, the later Graded (XF 90, SSV $3,000). 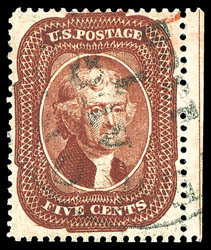 AN OUTSTANDING EXAMPLE OF THE 1857 5¢ RED BROWN TYPE I ISSUE. 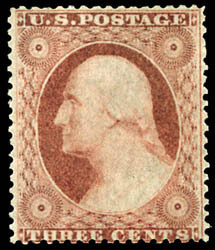 1857, 5¢ bright red brown, type I, choice centering within well balanced margins, rich vibrant bright red brown color, full perfs at top (two partially obscured by cds), Extremely Fine and choice; with 1991, 2003 and 2013 P.F. certificates, the later Graded (XF 90, SSV $4,500). ONE OF THE FINEST KNOWN EXAMPLE OF THIS RARE AND SELDOMLY ENCOUNTERED SHADE. 1858, 5¢ Indian red, type I, right margin guideline single, 1858 year date town and small portion of red transit cancels, well centered amid uncommonly wide margins, rich distinctive Indian red color, Very Fine to Extremely Fine, a choice vibrant example of this very scarce shade variety; with 1989, 1996 and 2008 P.F. certificates, the later Graded (VF-XF 85, SMQ $5,000). 1858, 5¢ Indian red, type I, neat town cancel, intensely deep Indian red color enhancing a beautiful sharp impression, attractively centered with perfs clear at left and just touching at bottom, Very Fine and attractive, an truly eye-arresting stamp; with 2012 P.F. Graded certificate (VF 80).